The Portuguese Sheepdog was developed in Portugal for use as a sheepdog, guard and general farm dog. 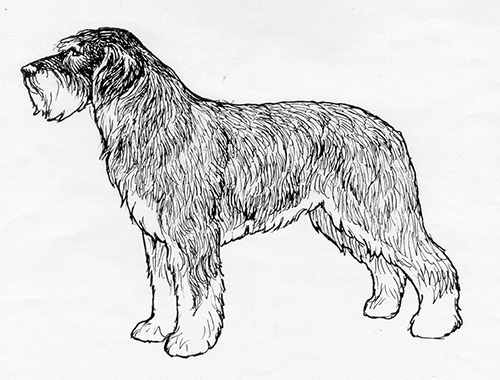 It is thought to be descended from the Pyrenean Sheepdog with crosses to the Briard. Currently the breed is used particularly in the Alentejo, for guarding and driving all the flocks and herds (sheep, goats, cattle, horses, pigs). 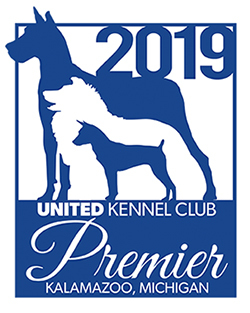 The Portuguese Sheepdog was recognized by the United Kennel Club July 1, 2006. A medium-sized dog, long coated and fairly long in body, with monkey like characteristics, therefore in his native region he is called the ‘monkey dog’. Very lively and intelligent, devoted to the flock and the shepherd but wary of strangers and a good night guarding dog. Strong and broad, not overly long, and never round. The stop is well-defined, and the toplines of the skull and muzzle are divergent. Slightly longer than wide, convex on the sides, but flat between the ears. There is a pronounced median furrow that runs halfway up the forehead. The occiput is prominent. Short, only about two-thirds the length of the skull. The nasal bone is straight or slightly hollowed. The lips are tight and thin and do not overlap. The Portuguese Sheepdog has a complete set of evenly spaced, white teeth meeting in a scissors bite. Slightly raised from the profile of the foreface, with large nostrils. Black color is preferred, but others are acceptable as long as it is darker than the color of the coat. Medium size and rounded in shape. Preferably dark in color with dark eyerims. Expression is lively, intelligent and docile. Medium length, with fine leather. Set high and hanging without folds when natural. If cropped, hanging straight and triangular in shape. Medium length, blending smoothing into the body, without dewlap. Shoulder blade and upper arm are of medium length and well muscled, with little angulation. Strong and straight, with lean knee joints and fairly upright pasterns. Longer than tall, with a long back that is level or slightly hollow. The chest is well let down, of medium width, and there is prominent forechest. The ribs are lightly sprung and oval in shape, sloping towards the back of the body. The loin is short, wide and rounded and the croup is slightly sloping. Straight and well separated when viewed from the rear. Upper thigh is medium length; lower thigh is longer and slightly inclined. The hock joint is rather low and open in angle. Rear pasterns are strong and single or double dewclaws are permissible. Round and well knuckled up, with long, tight toes and thick dark pads. High set, pointed, tapering towards the base, touching the hocks; when relaxed carried between the legs, more or less arched or curved at the tip; in action spreads out a little curved and fans out or rolls up. Disqualifications: Natural bob or docked tail. Very long, smooth or slightly wavy, forming long beards, moustache and eyebrows, but not covering the eyes. Hair very long on the head, body and legs, including between the toes. Hair of medium thickness and of goat like texture; dense and evenly distributed all over the body; there is no undercoat or wool. The colours are yellow, chestnut, grey, fawn and wolf grey, with shadings from light to ordinary and dark, and black, more or less marked with tan with or without mixed white hairs, but never with white patches, except a small patch on the chest. Ideal height at the withers for males is 17½ inches to 21½ inches. For females, 16½ inches to 20½ inches. Weight in proportion to size, approximately 26 to 40 pounds. Natural bob or docked tail.